Leave a comment on THIS post through Tuesday, October 25, 2016 to be entered in the DRAWING for a copy of the book below. If you mention in your comment that you’re a follower (see in the left sidebar “Join This Site” and “Follow by Email”), I'll add your name a second time in the drawing. U.S. mailing address required to receive a paper book. I may or may not have read books offered for giveaways. The mention and giveaway of books on my blog does not in any way indicate any manner of my endorsement of said books. Read book giveaway details at Disclaimers. To provide you security, please leave your email address like this: johnATyahooDOTcom. Winner announced in next Thursday's blog post. including Through Waters Deep (Revell, August 2015). 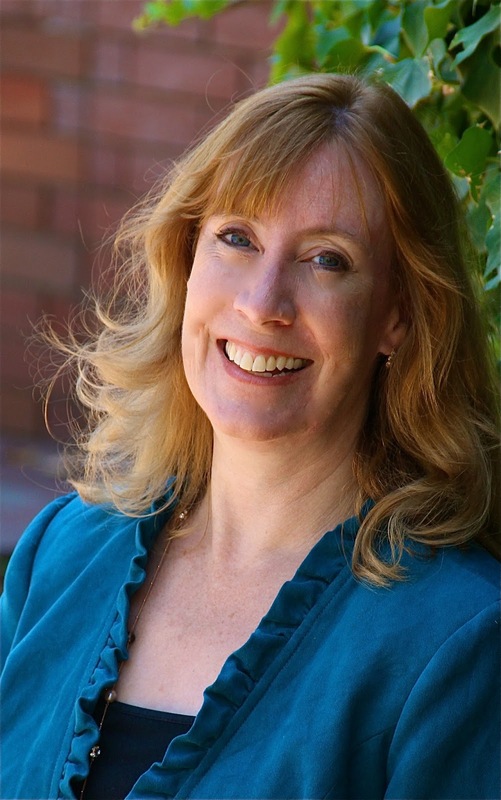 Her novella "I'll Be Home for Christmas" in Where Treetops Glisten was a finalist for the 2015 Carol Award, and her novel On Distant Shores was a double finalist for the 2014 Golden Scroll Awards. A mother of three, Sarah lives in California, works on-call as a hospital pharmacist, and teaches Sunday school. Learn more at her website. World War II. She finally has a chance to prove herself as a pharmacist in Boston. The demands of her new job energize her. But society boy Ensign Archer Vandenberg’s attentions only annoy—even if he is her brother’s best friend. During the darkest days of the war, Arch’s destroyer hunts German U-boats in vain as the submarines sink dozens of merchant ships along the East Coast. Still shaken by battles at sea, Arch notices his men also struggle with their nerves—and with drowsiness. Could there be a link to the large prescriptions Lillian has been filling? Book 2 of the Waves of Freedom series didn’t disappoint. This story of Lillian and Arch was a delight to read. Sarah Sundin develops all her characters, not only the hero and heroine, so well that they remain memorable after the last page is turned. Historical detail in this book is excellent. 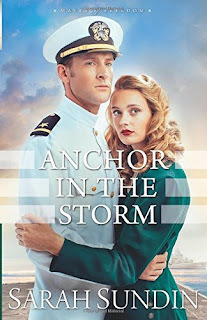 One commenter to this blog post will be selected to receive a print copy of Anchor in the Storm. Commenters, to enter the book drawing please leave your comment through October 25, 2016 and remember to leave your email address so I can contact you if you’re the winner. The winner of last Thursday’s blog post for a copy of Providence: Hannah’s Journey by Barbara H. Britton is Caryl. I’ll email you. Thanks all for commenting. Watch for more book giveaways. I thoroughly enjoyed the first book in the series, and had sort of forgotten that number two had released already. Thanks for featuring it and giving us the chance to win a copy! Patty, you're welcome. Thanks for commenting. I always enjoy World War II books. The cover is beautiful! I love WWII fiction and would love to win a copy of this one. Ann, thanks for stopping by to leave your comment. I am a follower and I love love love her books. Thank you for the chsnce. Deana, thanks for commenting and for following my blog! Stella, you're welcome. Thanks for commenting. Though I haven't started reading this series yet, I've read Sarah's prior books and really enjoyed them. Thanks for the chance to win Anchor in the Storm. Pam, you're welcome. Thanks for commenting. I appreciate you following my blog! Sounds really interesting. I have one of her books waiting for me on kindle and I would love to win this one! Rose, thanks for stopping by and leaving your comment. I love the first book in this series. The titles really grab my attention. This titles applies to my life right now. I am excited to read this book. Sonnetta, I pray that you find your anchor in your storm and things get better soon. Thanks for coming by to leave your comment. Anne, you're welcome. Thanks for stopping by to comment. My 83 year old aunt loves WW2 books so I would be sure to share it with her. Diane, your aunt probably remembers WW2 on a personal level. Thanks for commenting. Vera, thanks for stopping by and leaving your comment. Diana, you're welcome. Thanks for commenting. Love to have this book for our church library. Thanks. library (at) nhopc (dot) org. Thanks for sponsoring the giveaway. Hope whoever wins enjoys the book! I REALLY enjoyed the first in this series and would LOVE to read this one!!!! Amada, this one is good also. Thanks for commenting. Donna, you're welcome. Thanks for commenting and for following my blog! I have never read any of her books but would be delighted to. MH, thanks for commenting and for following my blog! Karen, you're welcome. Thanks for leaving your comment. Oops! I forgot to mention I am also a follower of your blog by email. Thanks! Alison, you're welcome. Thanks for following my blog and for leaving your comment! Thank you for featuring Anchor in the Storm, Jo! I'm so glad you enjoyed Arch & Lillian's story! Sarah, my readers and I are honored that you came by and left your comment. Thanks for writing your enjoyable stories! I've looked at this author, but have not yet read one of her books. lelandandbecky at reagan dot com. Stephanie, thanks for coming by and leaving your comment. I enjoy Sarah Sundin's books, but haven't read this one yet. Thanks for sharing the information. I like the theme and tone of your blog. Christi, thanks for stopping by and leaving your comment. Bethany, you're welcome. Thanks for commenting and for following my blog! Kathy, don't you just love all the gadgets we have to get through on blogs? Thanks for following my blog by email! That is not the same as joining my mailing list--click on this link to do that: http://amzn.to/2cfSroU Or click on the yellow button in the left sidebar near the top to join my mailing list. Thanks for commenting.